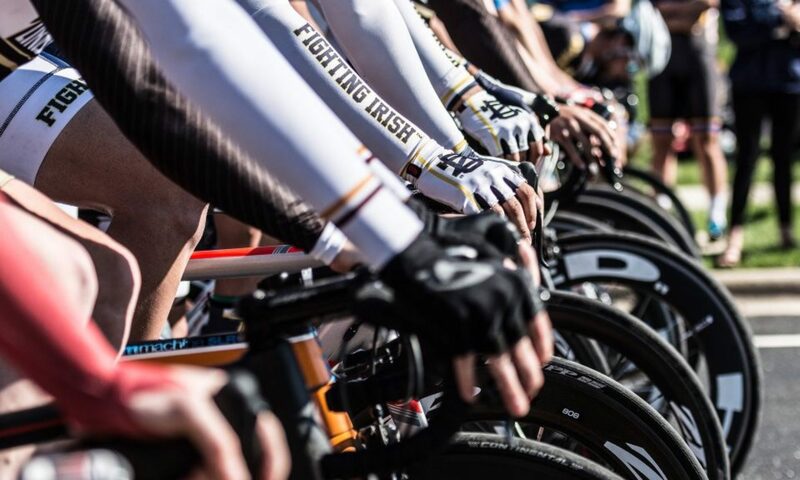 The 2017 road season starts in less than a week when the Cycling Irish will travel to Louisville, Kentucky for the Cardinal Criterium featuring races both Saturday and Sunday. After two days of racing, the team will continue south to Nashville for a week of hard training. Before returning to life under the Dome, the Irish will stop in Oxford, Ohio for one race day including a morning Team Time Trial and afternoon road race. Goals for this season include defending the MWCCC title and gaining experience for younger, developing riders. In addition, multiple riders are looking to book a ticket to race at Collegiate Nationals in Grand Junction, Colorado at the end of April. This year’s team looks promising with several returning riders including three with national championship experience, and several new riders with previous race experience. A few will race for the first time this season, but have put miles of hard work during training, and are eager to develop into racers. James Pratt –James is a senior and fourth-year racer who has served as team president this season. This will be his second season as an A rider, after a standout debut year where he finished second overall in the Division 2 conference omnium. 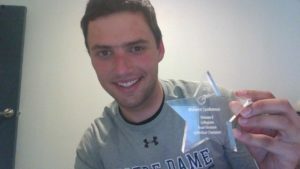 James continues to gain experience and consistently shows great teamwork with fellow Notre Dame racers in his category, traits needed for success at the highest level. Don’t count him out in a final with his quick top-end speed, something he hopes to showcase April 2nd in South Bend. Tony Pratt – Tony is currently a sophomore, and entering his second year as an A rider. Tony won the Men’s A D2 omnium during his freshman season, with multiple podium finishes. This year, Tony will work to continue his previous success in the overall rankings, but watch for him especially in flat criteriums and the Michigan State Road Race where he will be able to utilize his impressive horsepower. Sarah Cullen – Sarah is a 4th year racer and senior who began competing in Women’s A halfway through last year. She placed 3rd in the D2 women’s omnium in 2016 and hope to continue her success this season. Road races suit her riding style, specifically her endurance. Expect top placings and another bid for Nationals. 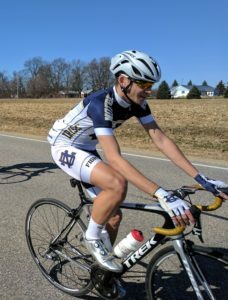 David McKenna – David, a grad student, will be racing for Notre Dame for his third season and he certainly hates to lose! David works well with other teams in race until he makes his moves. Look out for David in a multitude of races this season, and with the right cast of characters around him, on the podium as well. 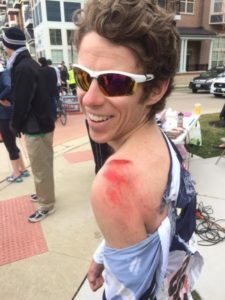 Connor Williams – Even though this senior spends so much time training for triathlons, he still somehow brings in podium finishes. Connor has natural talent and endurance which allow him to follow any attacks made in races. Strength on the hills and a talented C team will allow Connor to succeed this season. Look for him in the B’s come April. Anthony Hall – He may be quiet but watch out! This sophomore has incredible strength and makes hills look easy. Look for Anthony to take command and animate races this season. High finishes last season certainly bring the experience needed. John Caffarelli – John is only a freshman, but rides beyond his years. His confidence, experience and knowledge, and aggressive will to win look to aid him in moving up in categories this season. Look for him in the final when the road turns up and the race gets animated. Kate Ginsbach – Possibly the most overqualified women’s B racer ever, this graduate student is a Cat 2 mountain biker and has already represented Notre Dame at Cyclocross Nationals. Although she has never competed in a road race, we are confident her biking skills from other disciplines will carry over. Theresa Smart – A graduate student and new racer. Theresa has been training hard this winter and we are excited to see her race for the first time! Ron Mau – Ron is a graduate student and has been a great addition to the team this year. He will race for the first time this season and is really excited to start competing. Strong team racer who will excel in the D TTT and be a key feature in the lower category leadout train. Zach Llorens – Zach is a senior who joined the team this year. He is a strong rider and very knowledgeable about cycling. Zach will be one to look out for in the Men’s D races. 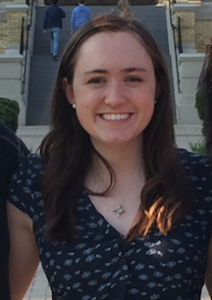 Sam O’Melveny – Sam, a junior, joined the racing team recently after volunteering to plan the Notre Dame home race. He is a fun teammate to be around! His first race is coming up and he hopes to gain experience and place well in the Men’s D races. Declan Kerwin – Declan is a freshman with a lot of riding experience. He has competed in a few races before. but will continue to develop and score points for our team! Pete Freeman – Pete competed with the team last year and enjoyed his season. We missed him last semester as he was abroad, but are excited to have him back on the bike now! Ryan Green – Ryan in unfortunately out this season healing from shoulder surgery. We wish him the best and can’t wait to have him back on the bike next year! On paper it was a strong showing by members of the team. The white team (Tony Pratt-A, John Caffarelli-C, Anthony Hall-C) was aggressive throughout the race, each member putting in soft and hard attacks. Hall’s attack with 2 laps to go, which was initially chased down by Sam O’Melveny, would’ve stuck without a ferocious chase by James Pratt of the Blue squad (Pratt-A, O’Melveny-D). O’Melveny had an attack of his own earlier in the race, and the elder Pratt covered his brother’s early jump and Caffarelli’s three attempts to escape throughout. Hall was caught at the second to last corner with James Pratt on the front leading out two members of the white squad, Pratt and Caffarelli, in that order, but the race was extended due to traffic on the course. On the added lap, O’Melveny started the dig for his sprinter, the tall, lean, but powerful J Pratt, while Caffarelli soon put in a MONSTER charge with his sprinter, the ever-handsome T Pratt in tow. It was looking to be a Pratt v. Pratt battle in the sprint, however James slipped his chain when the younger of the duo jumped for the line. Tony Pratt took the overall win, followed by his trusty leadout steed and breakaway attempt expert John Caffarelli in a close second. James Pratt slid across the line moments after followed by the built and chiseled Anthony Hall and craft Sam O’Melveny. The white squad took home the hardware for this first race of the series.